Artists' Acrylic by Winsor & Newton is a professional quality range of acrylic colour which remain as brilliant when dry as when first applied wet, unlike traditional acrylics that darken as they dry. This makes the process of mixing colours much simpler for the artist as what you see is what you get! It also features a longer 'open' working time, allowing more time to work on those fine details. 80 colours are available in this 60ml tube size. The 39 most popular colours of Winsor & Newton's groundbreaking, professional quality Artists' Acrylic Colour are available in these tubes of 200ml, offering up to a 35% saving over buying smaller tubes for busy artists. Featuring a 20% longer 'open' working time and minimal wet-to-dry colour shift. Winsor & Newton Artists' Acrylic is their finest quality acrylic colour, made using breakthrough technology allowing for a minimal wet-to-dry colour shift and 20% longer 'open' working time. White Winsor & Newton's Artists' Acrylic range is available in 237ml pots, offering a saving of up to 45% over buying smaller tubes. Winsor & Newton Artists' Acrylic paint is considered by many to be the finest quality acrylic paint currently available. Winsor & Newton carried out extensive research and development over many years to formulate the range to have more brilliance of colour than any other brand of paint. They were the first ever acrylic paints to eliminate colour shift from their wet to dry state, due to the development of a new type of binder which remains transparent as the paint dries. The Artists' Acrylic paint range also has an extended drying time of 20 to 30 minutes (dependent upon the thickness of colour) which provides the artist with a considerable amount of time to blend and work with the paint on both the pallet and the surface. Brilliance is defined as the intensity, richness and depth of colour. Research has shown that ‘Brilliance of Colour’ is the most desired characteristic of an acrylic paint to the artist. As a result, during the production of Artists' Acrylics, Winsor and Newton have employed their market leading colour creating expertise to make sure the range has an unrivalled depth and brilliance of colour. Although the colours have a high level brilliance they are not garish. Each paint in the range has a purity, clarity and depth of colour which is apparent whether it is applied directly from the tube or in a thinned state; with even the white, blacks and earth colours being pure and bright. The preceding range of W&N Artists Acrylics brought superior brilliance, but the latest range has a level of brilliance which is unrivalled due to a combination of high strength pigments of the highest quality and a ground-breaking transparent binder. Until fairly recently acrylic paints would colour shift to a darker in tone as they dried. This makes accurately matching colours very difficult and the skill of remembering the exact tone when mixing paint is - for many - difficult to master. 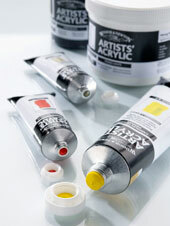 With Winsor & Newton Artists Acrylics no colour shift occurs from the wet to dry state. Colour shift is a result of the binder transforming from a white to a clear state while it dries. With most acrylic paints, as they dry they appear darker due to the white emulsion binder drying and becoming transparent within the colour. This causes difficulties for the artist when they return to a painting which has dried or if they attempting to match the colour of a dried area of paint. As a result of their unique expertise in Acrylic paint making, Winsor & Newton have been able to develop a new type of binder which is clear when the paint is in a wet state and it remains transparent when the paint dries. This results in a paint which has virtually no colour shift, with any difference in colour from wet to dry being less than or equal to comparable colour in W&N Artists' Oil Colour. Winsor & Newton has developed their Artists' Acrylic Paint to provide the balance between an extended working time and a convenient drying time. One of the main attributes of acrylic paint is that it dries rapidly. This enables several layers of paint to be built up in a single painting session as more paint can be applied in the same area within just a few minutes. However, the quick drying properties of acrylics can restrict or prohibit certain techniques used in painting, particular when in comparison to painting with oil paints. The working duration of Artists’ Acrylics has been increased by one fifth longer than the preceding range of Acrylics. These Artists Acrylics now have a drying time in the region of twenty to thirty minutes; depending upon the thickness of paint applied to the surface. They are prefect for artists who like to take their time to mix their colours on their palette or surface. The result is a range that allows artists to match colours more easily from palette to canvas and see a painting as it will actually look when finished. Covering strength is determined by the strength of the particular pigments which are used, the opacity of the pigment and amount of pigment which is in the paint. When compared to other acrylic paints on the market Winsor & Newton Artists' Acrylic has the greatest degree of pigmentation, tinting strength and covering power. It is also able to cover surfaces far quicker than the other brands of acrylic paint and typically only one coat of paint will be needed. W&N Artists' Acrylic Paints been expertly formulated to have a buttery, smooth, thick and non-stringy consistency which is appreciated by many acrylic artists. These characteristics make it less difficult to handle during the painting process and allow the paint to be easily blended with other colours or with water to be used for watercolour-like wash techniques. Artists' Acrylics hold their profile, retain brush-strokes and are superb for creating impasto effects. Furthermore, they dilute slowly and progressively as water or other mediums are added, allowing optimum control over the medium. They are perfect for palette knife impasto applications and retaining brush strokes because they will not flatten when they dry. However, a soft brush can be used to make the paint flow out smoothly, providing a smooth surface to the painting. Acrylic paint is by far the most versatile of all types of medium. They are compatible with the largest variety of surfaces and may be diluted with primers to form transparent glazes and washes or can be used straight from the tube for an impasto style of painting, or anything in between. Artists' Acrylics are also designed to ensure they will dry to a non-sticky water-repellent film which acts to protect against dirt and dust from embedding into the painting as time passes and also will prevent completed artworks from adhering to one another when stacked together. The entire range of 80 colours of Artists' Acrylic paints are considered to have a high level of permanence, and each paint has been accessed to have either a 'Extremely Permanent' or 'Permanent' rating. The entire selection of 80 colours is available in tubes of 60ml. A smaller assortment of the 39 most popular colours is supplied in tubes of 200ml. White and black colours are available in 474ml & 237ml tubs.